Turbo (Ryan Reynolds) is a speed-obsessed snail with an unusual dream: to become the world's greatest racer. This odd snail gets a chance to leave his slow-paced life behind when a freak accident gives him the power of superspeed. Newly revved-up, Turbo embarks on an extraordinary quest to enter and win the Indianapolis 500. Accompanied by a dedicated pit crew of trash-talking adrenaline junkies, Turbo becomes the ultimate underdog by refusing to let his limitations get in the way of his dreams. Download Turbo in Digital HD from the iTunes store. Listen to the Turbo soundtrack on Apple Music. Turbo images are © 20th Century Fox. All Rights Reserved. It would be easy to simply stamp Turbo as DreamWorks' Cars rip-off. Certainly the similarities are striking, from high speed animated racing and a spot on the map on the verge of extinction right down to the chrome font featured on the poster art. 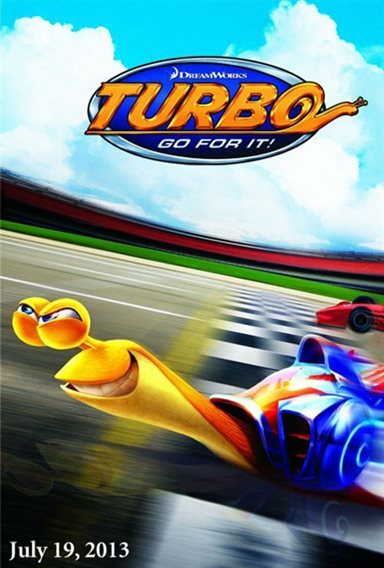 That doesn't mean Turbo can't hold its own in a race against Pixar's speed-centric digitally animated powerhouse franchise. The gap between the contenders isn't very wide, not from an animation perspective, not in terms of voice acting, nor story, nor heart. Turbo crosses the finish line with flair, crafting a touching, exciting, enveloping experience that's less about the race and more about the inner strength, the courage, and the support it takes to live a dream and see it through to the end, no matter the circumstances. The picture, then, is certainly awash in dramatic cliché, nearly as much as it is in Cars-like plot points and style. Yet for a movie that's not all that original, it manages to work incredibly well across the board. It's a classic stand-up-and-cheer sort, a movie that will leave the entire family satisfied with the experience. Theo (voiced by Ryan Reynolds), a small snail amongst many, dreams big of life in the fast lane. He idolizes race car driver Guy Gagné (voiced by Bill Hader) and is always striving to improve his speed, much to the amusement of his fellow snails and much to the chagrin of his older brother Chet (voiced by Paul Giamatti). When Theo's television set breaks -- just as Guy is about to share his secret of success with the world, no less -- the suddenly dejected and defeated snail leaves home to sulk and watch the speeding Los Angeles traffic flow on past him. His fortunes take a turn for the better when he finds himself on top of a car involved in a high-speed race. He's pulled into the engine but instead of meeting a terrible death, he's infused with nitrous oxide and discovers that he's now fast. Very fast. Not fast for a snail, but fast enough to hang with Guy and other racers. Another stroke of luck has him and his brother captured by Tito (voiced by Michael Peña), one-half of a brother team working at an out-of-the-way taco stand that, along with a few other nearby businesses, is on the verge of disappearing forever. Tito quickly learns Theo's secret and wishes to exploit it for the restaurant's business fortunes by collecting enough money to enter Theo into the Indianapolis 500. His brother Angelo (voiced by Luis Guzmán) outright rejects the proposition, but Tito convinces his fellow nearby business owners that their scheme just might work. They head to Indy to enter Theo, now going by the name Turbo, into the race, but the question remains whether the snail can hang with the speeding cars and not end up the world's most famous case of roadkill. Turbo in many ways embodies the modern digital children's movie. It's abundantly colorful and amazingly detailed to the cutting edge of modern technology. The story blends action, humor, and well-developed and hugely likable characters with an evident tenderness and an agreeably simplistic message made even more meaningful thanks to an abundance of heart and a readily evident soul. It's a quality movie all the way around, even considering the rather large bit of thematic, structural, and plot unoriginality present throughout. Yet the picture races past its similarities to other films, manages to create a unique identity, and settles into the upper-tier of animated pictures, playing well enough for repeat viewings and zooming on by much of the competition by holding firm to the winning formula of a complex and colorful exterior combined with a basic yet touching and ever-relevant inside lane message. That message may be over-simplified throughout the film, but it's evenly integrated into the entire experience. Instead of wearing thin, it only grows more relevant as the story progresses, culminating in a terrific finish that embodies its very spirit. The film centers its values on the power and importance of belief. Turbo believes that, one day, he will be fast, faster than he already is. He works hard and certainly befalls a good bit of luck to get him to Indianapolis, but at the core is that constant push to be better and the unflappable determination to be the snail he believes he's destined to become. However, his brother Chet tries to push him down, to keep his dreams in check, discouraging him from hoping for something greater than what nature has given him, to push away thoughts of beating his lot in life to become a snail separate from the others. Then, there's Tito, a man who dreams big and wildly -- sometimes a bit too big and too wildly -- of finding greater success with his taco shop. His brother, Angelo, is content to settle for mediocrity, celebrating a good day of a few extra sales but failing to find the determination to seize the opportunity and shoot for the stars. The film fully explores its core values in Turbo and Tito's team-up, playing them as something akin to interspecies brothers who demonstrate what can happen when two dreamers come together to accomplish the impossible, whether with a bit of help or completely on their own. Much of Turbo's success may be traced to its construction. The characters are rather stock but nevertheless very well shaped by the writers and animators both, the former providing them a soul and the latter a fun, memorable embodiment to carry the film's message and add some attractive visual spice to the experience. Though the characters are rather smooth and plastic-like, they show a very real, very perceptible energy and believability, which is as much a result of terrific voice acting as it is quality animation. Ryan Reynolds is quite good as Turbo. He brings the character's innermost being to the surface, finding a stabilizing force that helps keep the audience with the character even in the midst of serious cliché. Bill Hader impresses as the egotistical, modern-day aristocratic racer Guy Gagné, while Samuel L. Jackson and Snoop Dogg are terrific as a couple of snails that help Turbo along in his quest. The real voice stars, however, are Michael Peña and Luis Guzmán, whose voices shape the film's two most memorable characters. There's an unmistakably excellent rapport between them that's shaped not only by the voices but through an animation that creates a very real brotherly harmony about them, a visually perceptible chemistry in the way they interact and even look at one another in moments of contentment and frustration both. A scene in which they share a taco lunch is made all the more special by a subtle glance and a sincere smile that open up the characters and give them a lifeblood most other animated figures lack at their very cores. Turbo's Blu-ray transfer easily wins a five-star rating. This Fox/DreamWorks collaboration presents a stunning display of animated eye candy that's as good as any similar title on the market. The animators have left nothing to the imagination. While characters appear a little bit like plastic, their environments are richly detailed, almost beyond belief. Little imperfections in roadways, pebbly backyard terrains, veins in leaves, individual blades of grass, and fine details on race cars are revealed to current technological perfection. Turbo zooms onto Blu-ray with a powerhouse DTS-HD Master Audio 7.1 lossless soundtrack, alongside an assortment of additional audio and subtitle language options. The primary English track offers incredible stage presence in every area of concern. Whether a lawnmower powering through the stage, jets zooming overhead, or cars rumbling down the track at high speed, the track delivers a wide, seamless soundstage and brings its major effects to life with precision placement, movement, and sonic accuracy, right down to the ribcage-rattling low end support pieces. 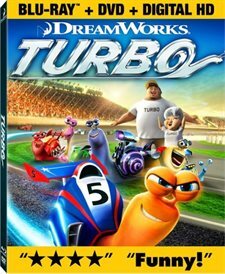 Turbo contains a typical allotment of extras for a DreamWorks Animation title. Notably absent, however, is an audio commentary track. Champion's Corner: A sports newscast featuring an interview with Turbo. Smoove Move's Music Maker: Movie-inspired music videos for Speedin', The Snail is Fast, Back to Indiana, Jump Around, Let the Bass Go, and Eye of the Tiger. Team Turbo: Tricked Out: A brief look at the characters' unique shell attachments. Meet Tito -- Deleted Scene: Director David Soren shares his favorite deleted scene. It's presented in a raw hand-drawn form. The Race -- Storyboard Sequence: Director David Soren introduces a storyboard for one of the film's most critical scenes. The final version is shown in a small box on the bottom right-hand corner of the screen. Be An Artist! : Following an introduction, Head of Character Animation Dave Burgess shows viewers how to draw Turbo - Garden Shell, Turbo - Racing Shell, Burn, Smoove Move, Skidmark, Whiplash, White Shadow, and Chet. He also shows viewers how to create their own custom racer. Shell Creator: An interactive supplement through which users may digitally create and customize their own racing shell, beginning with a base character and changing or adding shell colors, shell graphics, a spoiler, an engine, pipes, one of thee optional accessories, and a background. Creations may be saved to a gallery. Sneak Peek: Previews for The Croods, Shrek: The Musical, DreamWorks Dragons: Defenders of Berk, Turbo F.A.S.T., Walking with Dinosaurs, Epic, Kung Fu Panda: Legends of Awesomeness, and Holiday Favorites. Digital Copies: UV and iTunes included. Turbo is a fun, action-packed, heartfelt, and sincere journey of a small creature destined for big things. Sure that's a recycled plot, but it works surprisingly well thanks to terrific animation, better voice performances, and a focus on message that never wavers and culminates in the perfect ending for the story. It's suitable for all ages and will please children and adults alike with its energy and sincerity both. This DreamWorks/Fox Blu-ray 2D release of Turbo features reference video and audio. A decent assortment of extras are included. Very highly recommended.